When it comes to keeping your home tidy and organized, you need some of the best plastic storage cabinets. Storage cabinets keep things organized and easy to find. These cabinets are usually made of different materials like wood, plastic and sometimes metal. However, plastic storage cabinets tend to be more affordable, weather-resistant and lightweight when compared to wood. This is why it makes sense adding some set of plastic storage cabinets to your home. In this post, we help you choose the best plastic storage cabinet on the market by reviewing the top models. Read through our plastic storage cabinet reviews below and select one model that will best suit your needs. The Keter plastic storage cabinet is a sturdy and elegant design to start our list. The cabinet features a sturdy resin construction that prevents rust, peel and dents. 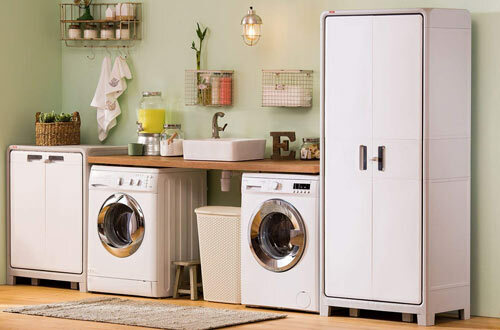 It features four adjustable storage shelves for enough storage space. There is also removable flip over bins for easy use and cleaning. A door sealer further ensures better protection from humidity and rust. Overall, this is an efficient cabinet with three different ways to store. It also holds up to 66lbs load capacity. This is a highly rated plastic storage cabinet and one of the best-sellers on the market. 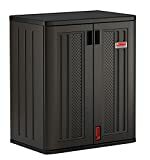 It is a heavy-duty storage cabinet made in the United States to the highest standards. The cabinet features adjustable shelves to fit different sized items. There are 1-4 shelf units to offer enough storage space. This is a pretty large 21 cubic feet storage cabinet that holds up to 690 pounds of weight. 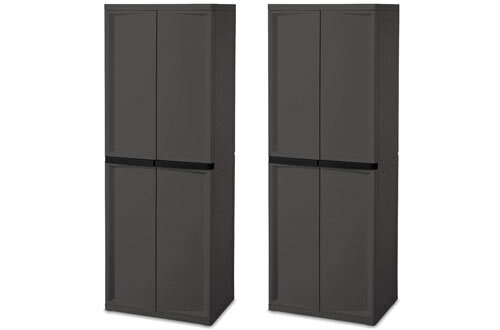 It is a pretty versatile cabinet with double-door storage featuring lockable doors. A cabinet is an ideal option for heavy tools and paint cans. The rugged high-density plastic construction ensures long-term use. There is also a storage lock container which is not included. Overall, the cabinet measures 36 inches wide, 72 inches high and 18 inches deep. It also comes with a lifetime warranty so that you can buy with confidence. 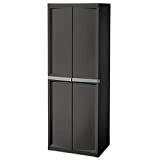 The Langria storage cabinet is a modern design with some beautiful curly design, translucent doors and black panels. It is a simple modern design that adds some style to your home. 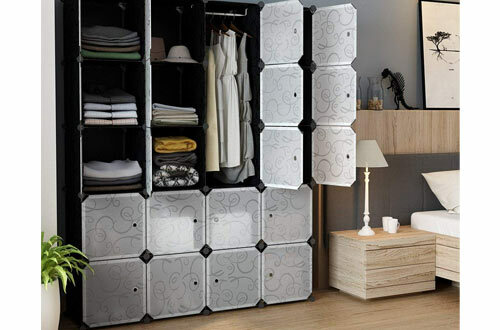 The featured cubes can be stacked or used separately depending on the storage need. 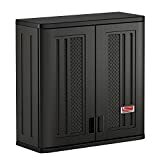 It is a durable cabinet with durable steel cubes and resistant plastic connectors. Every single cube can hold a maximum 10lbs. The panels are waterproof and dust-proof to allow for easy maintenance. 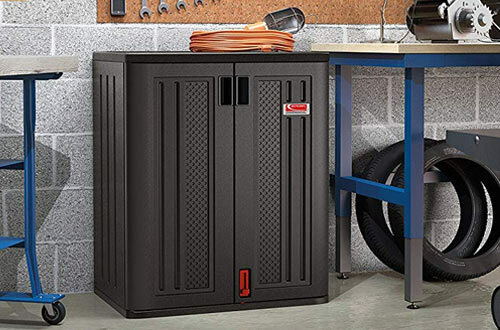 Overall, this is an excellent storage cabinet with hassle-free installation. 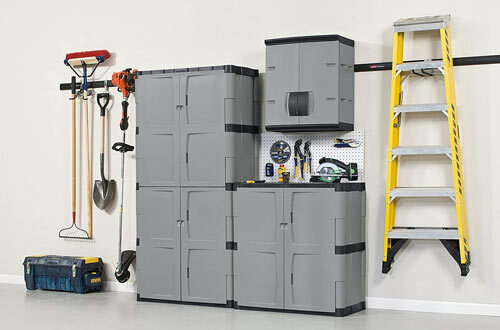 This is a multi-wall panel storage cabinet engineered for stability and strength. It is a sturdy and durable cabinet with heavy-duty resin to prevent damage from rusts, dents and scratches. The assembly of the cabinet is also pretty simple without the use of any tools. The shelves feature reinforced shelving to resist bending when heavy loads are stored. Overall, this is a durable cabinet that can hold up to 200 pounds. 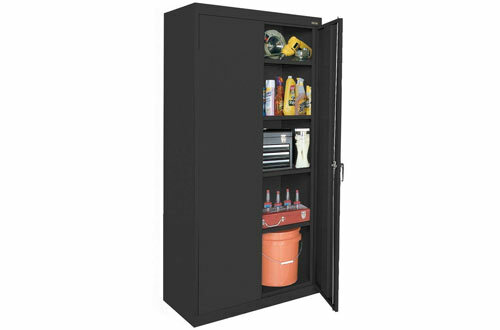 This is another mid-size storage cabinet with a heavy duty resin construction. The cabinet is rust, scratch and dent resistant retaining its original shape over a long period. It is a pretty simple design that assembles fast without any tools. It also features metal reinforced shelves that hold a maximum of 50 pounds. Overall, the Suncast cabinets are quality brands made to the highest standards in the USA. 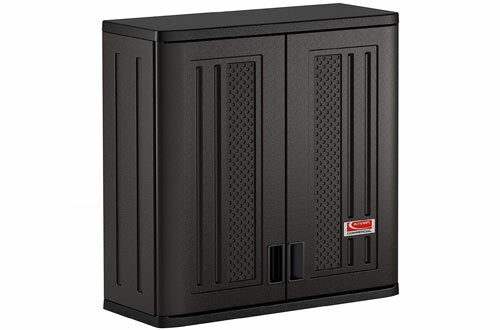 The Sterilite cabinets are another big brand in the industry with high-quality storage cabinets. The 4-shelf adjustable Sterilite cabinet comes in a unique pack of two to offer more storage space. 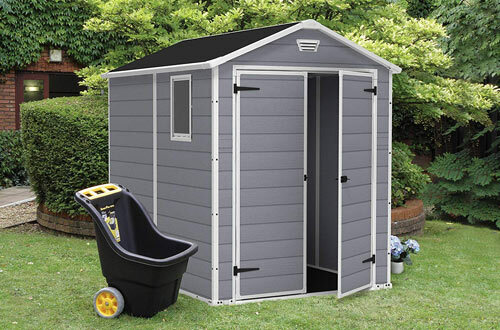 It is another sturdy choice with heavy duty plastic construction for long-lasting durability. The cabinets feature four adjustable shelves to suit different storage needs. 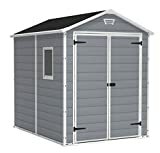 It features a free-swinging door in and out for easy removal and access. 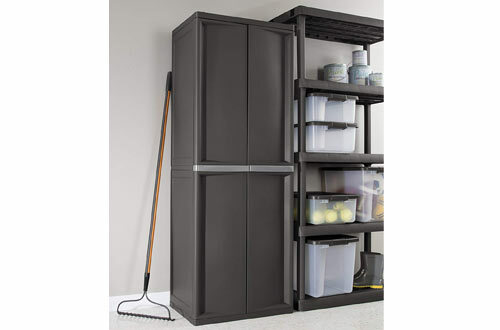 This is a welded plastic storage cabinet with a sturdy and durable construction. The cabinet is strong and stable with two hinged doors. 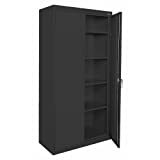 It is a pretty simple design cabinet that features a swinging locking handle and three-point locking system for added security. The cabinet further features a powder coat finish to resist chipping, corrosion and rusting. 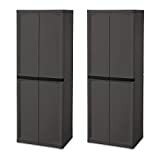 It is a great buy that comes with cabinets already assembled for easy assembly. The Keter Manor plastic storage box is another perfect fit when you want to more space indoors. The cabinet helps garden tools keeping your outdoor tidy. It is a sturdy polypropylene construction cabinet with steel reinforcement for long-lasting durability. It comes in a stylish wood texture to complement your outdoor space and look stunning. It also features two large doors for easy access. 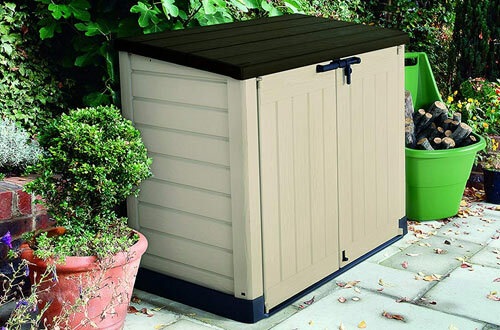 This is another high-quality outdoor storage cabinet that can help you create more space at home. The cabinet is sturdily made to withstand outdoor weather elements and serve you well. 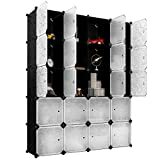 It features the high-density polypropylene outer casing and steel metal reinforcement for long-lasting durability. The stylish wood like texture helps complement yours outdoors. These are the best plastic storage cabinets to help organize your home tidily and create more space. The cabinets are highly rated and offer the best value for money. Make sure you read our reviews before selecting one that best suits your needs.